Collies are known for their intelligence and there is no surprise that names of philosophers, scientists, and medical doctors are popular choices. Plato, Darwin, and Hubble are a few ideas that stem from this naming tactic. A fun spin-off of this approach is to choose real or fictional doctors that don’t actually practice medicine. To get you started, Phil, Dre, Watson, Cosby, Seuss, Finlay, and Moreau are a small sampling of the available options. Many Collie names have been passed down through the generations and can be traced back to roots in Scotland and Northern England. 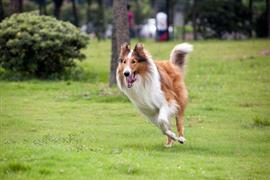 In Scotland, a few of the more popular working Collie names are Tess, Meg, and Bess. Shorter names are a favorable option among most working dogs as they are typically easier to call out. Some of our pages will contain a subcategory. A subcategory is a slightly more specific grouping than the main topic of the page. For a subcategory, we will include a separated table of names and corresponding descriptions. An example of a subcategory of Red Dog Names would be 'Dog Names Inspired by Red Wines'. If you have any subcategory ideas for the Collie Names page, we would love to hear them. Use the form below to submit your ideas.